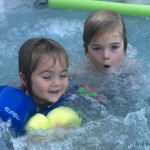 Lola and I were provided a Safety 1st UltraMax™ Air 360 4 in 1 to review. All opinions are my own. 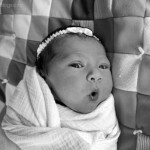 The biggest and most important purchases a parent or parent to be makes is the buying a car seat. When I was pregnant with Malone, I spent hours and hours researching brands and comparing features and benefits. I got to the point that I was so overwhelmed with it all that I made a huge spreadsheet to keep the benefits, price and safety features straight. 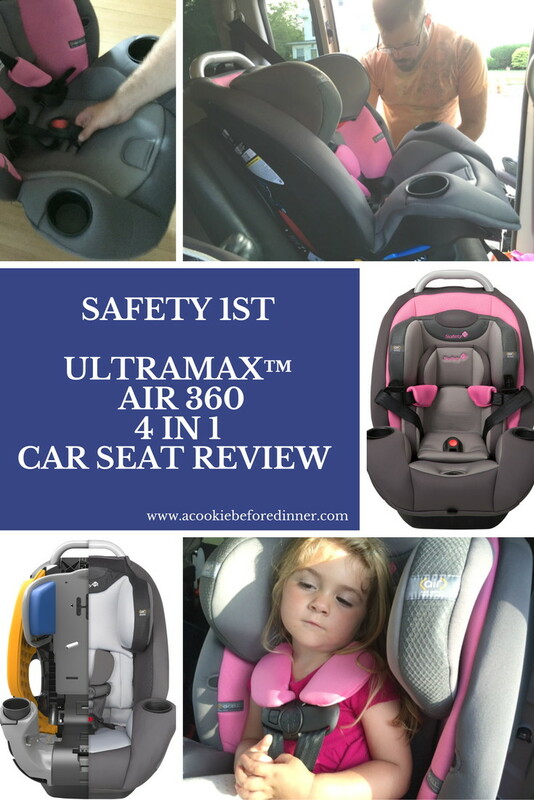 Had the Safety 1st UltraMax™ Air 360 4 in 1 car seat been around 7.5 years ago, I wouldn’t have had to do that because the choice would have been easy! My husband Mike and I both agreed that this the car seat of all car seats. Safety features as well as simplicity of use are both really important to us. 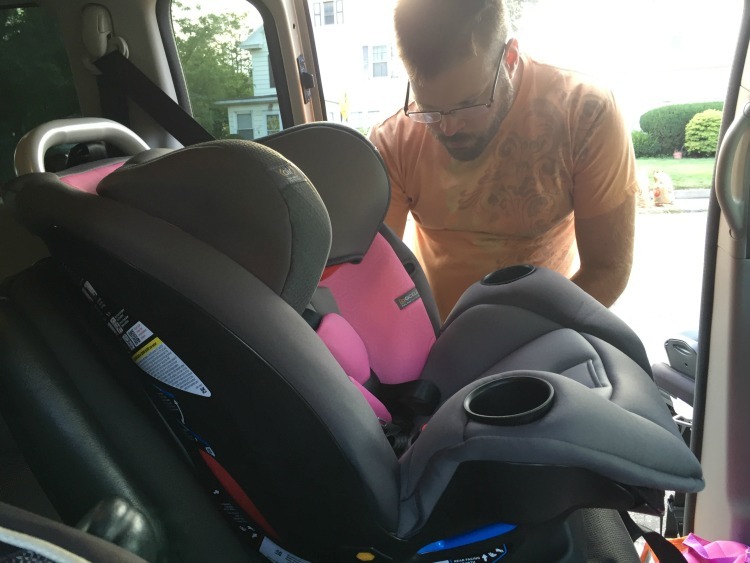 We found the UltraMax™ Air 360 4 in 1 car seat to be really easy to get set up for Lola. We were able to adjust the positioning of headrest and harness with one hand. The trickest part of set up was adjusting the safety buckle, but even that wasn’t too hard! Lola is not using the seat in a reclined position, but it has 3 reclining positions. One of the features of this car seat that I’m most excited about is the simplicity of cleaning it! 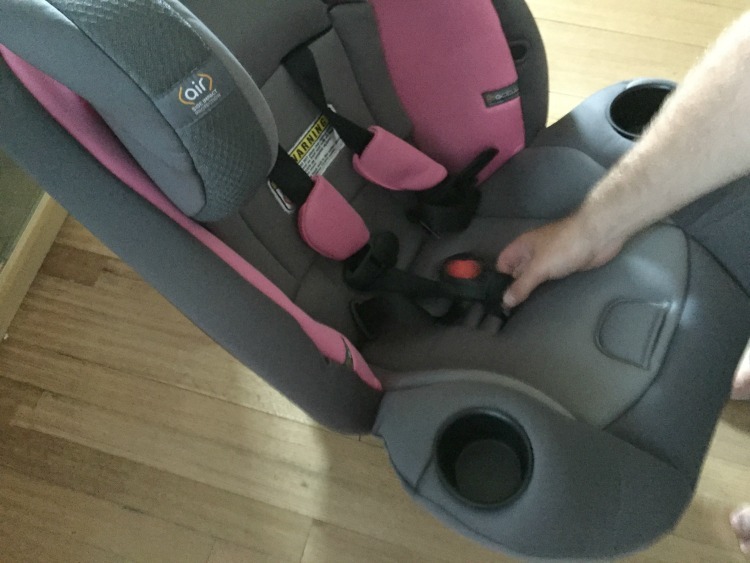 The cup holders are dishwasher safe and the ClickClean™ seat pads can literally just be lifted out and thrown in the wash. With other car seats we’ve had, we’ve had to take the entire car seat a part to clean it. And when you have kids who like to get car sick, that’s no fun! 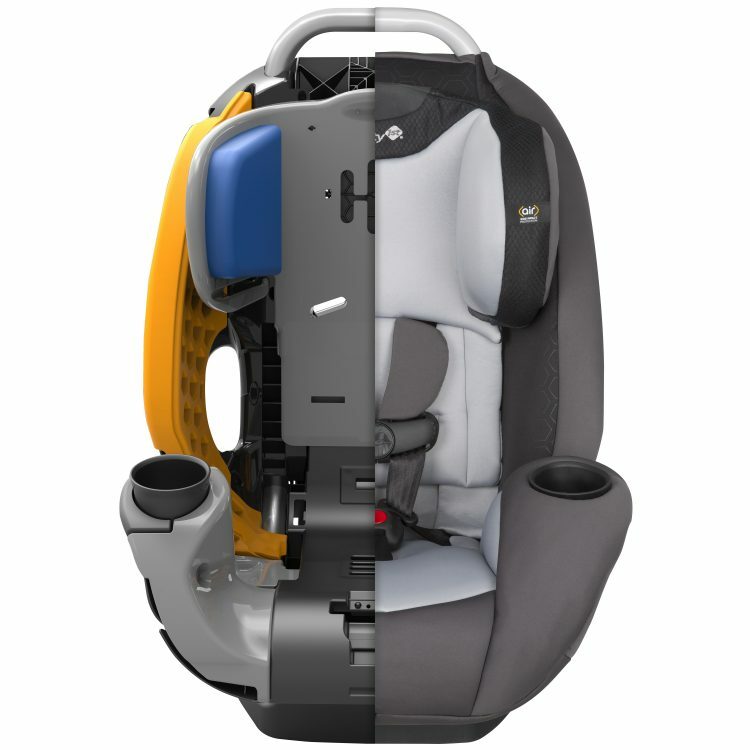 Safety 1st put the UltraMax™ Air 360 4 in 1 car seat is full of safety features! There are six layers of safety with 360 Protect™ that when combined provide a complete safety system! 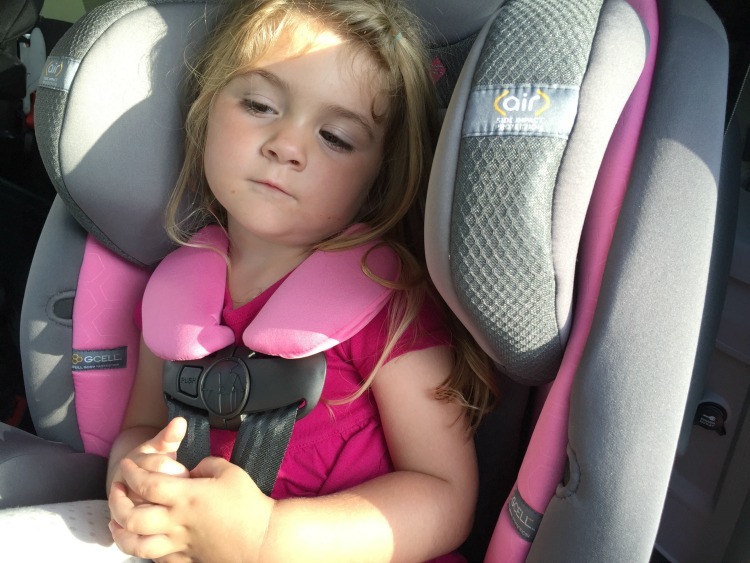 Safety 1st put the UltraMax™ Air 360 4 in 1 car seat to the test! 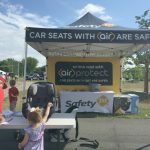 Safety 1st is committed to making sure that their car seats are really safe! This car seat features features 360 Protect™ for 6 layers of proven safety. Their car seats go through rigorous safety testing and are crash tested at every angle. These angles include rollover, front impact, rear impact and side impact testing. The UltraMax™ Air 360 4 in 1 seat really is a 4 in 1! In addition to all of the amazing safety features, the Safety 1st UltraMax™ Air 360 4 in 1 car seat is one that can grow with your child! It’s unique design allows it to be be used from 4 to 120 pounds. It can be used as a rear facing seat for babies from 4 to 22 pounds, used as an extended rear facing car seat for babies/children from 15 to 50 pounds, used as a forward facing 5 point harness car seat from 22 to 65 pounds and used as a seat belt positioned booster seat from 40 to 120 pounds (and 57 inches). Isn’t that amazing? 1 car seat can do so much! 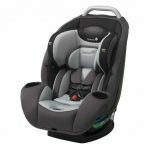 Buy: The Safety 1st UltraMax™Air 360 4 in 1 car seat is available in three design choices (Raven HX, Pink Blush HX, and Aqua Mist HX) and sold exclusively at Babies R Us. It has an ARV of $259.00. The Tiny House movement is sweeping the nation! At Safety 1st we’re here to help you keep your family safe, in any size home. We’re excited to give you and your family the chance to win a tiny house of your own, outfitted with the very best safety products we offer. For over 30 years, Safety 1st has consistently delivered innovative products to keep your family safe while at home or traveling. From stairway gates to car seats, their product engineers have given parents the power to keep generation after generation of kids safer. Innovation comes naturally to Safety 1st and they absolutely love the creative design of these tiny houses and marvel at the sense of freedom the mobile versions offer to families. A tiny home is also a great place for their new Outsmart™ line of locks and latches – the smartest way to protect your kids from dangers in the home while giving you the peace of mind you need to allow them to discover the world around them. The Tiny House Giveaway began on 6/15/16 and ends on 5/1/17. The Sweepstakes consists of twelve (12) monthly prize drawings, one (1) Second Prize drawing, one (1) Third Prize drawing, and one (1) Grand Prize drawing. To learn more the Tiny House Giveaway and to enter, head here to their online entry form. Next post Win $125.00 Amazon Or Paypal. Giveaway! That car seat looks awesome. Safe and it’s pink! I want a car seat that has a higher weight limit so my daughter can use it longer. I love safety first seats! I’m reading so many positive things about this car seat. Sounds like one of the best options! 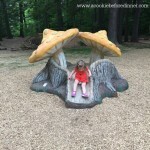 This looks like a great seat! We need new seats now that we live close to grandparents, so winning this would be great! Ooh, I’d love to win!! Our infant car seat is getting too small for our growing boy! Such a great giveaway. 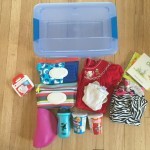 Thank you so much for the chance to win this for my baby! What a fantastic car seat (review). I would love to have one like this and would feel that my loved one would be safe inside. 1) What is the depth of this seat? I want to make sure it will fit into my car before I purchase it. 2) What type of anchor latches does it have? Are they really easy one-handed ones?